This weekend was the 50th 上南戦 (Jounan-sen), the annual competition between 上智大学 (Sophia University) and 南山大学 (Nanzan University). 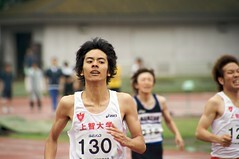 Of course, I took a few pictures of the track and field events, where I attended with the 陸上部 (track club). I didn't actually participate in any of the events, though. Click through for the rest, of course. *sheepish* I just got home and I'm talking venting to you. I'm kind of distracted here. http://www.flickr.com/photos/doubt72/3603196781/in/set-72157619402435320/ <-- XDDD She looks so much like she's cheering him on! http://www.flickr.com/photos/doubt72/3603327379/in/set-72157619402435320/ <-- is it bad that I giggled because they looked like Tweedledee and Tweedledum? http://www.flickr.com/photos/doubt72/3604166258/in/set-72157619402435320/ <-- *grins* She looks like she's shouting in his ear. LOVE it. http://www.flickr.com/photos/doubt72/3604170708/in/set-72157619402435320/ <-- "... following the leader, the leader, the leader ..."
http://www.flickr.com/photos/doubt72/3603386033/in/set-72157619402435320/ <-- for some reason this makes me grin. I LOVE THIS PICTURE.